Synopsis: A captivating story of reincarnation, redemption, and forgiveness even though holly O'Rourke is having problems with her longtime significant other, James, she has never entertained thoughts of infidelity. that is, until the day she had a chance encounter with charlie, a handsome coworker. James promises he will change and work on their relationship, but holly's feelings for charlie just won't go away. distressed by her mixed emotions, holly schedules an appointment for a reading with a psychic medium, where she discovers her adulterous past lives and their tragic consequences. holly learns to do her own past life regression though self-hypnosis and uncovers not only lives that she shared with James and charlie, but how other people in her present life have been with her in the past - the threads of their lives interwoven for centuries holly is stunned by recurring themes and the issues of karmic justice that need to be addressed where will her karmic path ultimately lead? 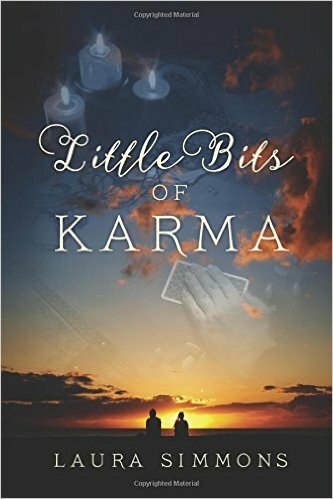 find out on little bits of karma, an entertaining new book about spiritual cause and effect. Review: first of all l would like to say a big thank you to Laura Simmons for sending me this book and giving me a chance to read this book. l was sent this book in exchange for a honest review. l am so glad this book is on my bookshelf. l would tell people that you should step outside your comfort zone with books it is good to add more authors and genres to your reading portfolio even if you do not read books like this. l normally read books like this but l stepped outside my comfort zone with authors and genres l am so glad l did because l have read so many great books. l highly recommend this book. l was sent this book by bostick communications who l want tot say a big thank you to as well. the author is really nice and kind l would love to read more from this author l loved reading about holly past life regression and that people she knows in the life she lives are in her past life. it was horrible to read that James cheated on holly after 9 years together they have been together 11 years and holly cut up most of his clothes and dirty the rest. amber should not have stopped taking her birth control pills to trap James because it is wrong to trap any guy.it was nice for holly to have so many people who care about her. holly was feeling guilty about a kiss with charlie l could not believe James kept cheating with so many women from poor holly. l was happy to read that holly's first husband who beat her up when they were married has changed his life around. it was horrible to read that James tried to put a hit on a pregnant woman but he did not know he was asking amber's cousin to help make the pregnant woman disappear instead her cousin told James to do the right thing by amber and the baby or he will make him disappear l like that holly had a cat called fate that slept cuddled up with her the night she kicked James out. it was funny to read that holly took a mallet to James's brand new truck it is better than hitting him. l like that charlie sent holly a teddy bear which she called theo Barry so holly would have something to hug when she was feeling sad. l was glad James did the right by amber and married her and started falling in love with her and that their daughter Isabella maria was born healthy and that James got up with Bella at night so amber could sleep. l was happy that charlie asked holly to marry him and Lisa was fine with holly and charlie going out together. l was sad to read that James had passed away age 54 when Bella was under 2 months old and was happy James thought about her future with money he got from drug dealing and gamble and holly still give amber the money knowing James would want his daughter to go to college and uni. l was upset to read that holly hit her head after slipping on a cup of ice l was glad to read that holly made a full recovery and glad she had great friends like Patricia and Lisa it was good to read that holly made peace with roger and alex her two ex-husbands and that Lisa apologized to charlie for being a horrible wife. so happy holly and charlie are getting married and Lisa and roger are getting married too. l really enjoyed this story l would love a follow on to this book and more of the story. l was happy to read that holly got pregnant with twins and they won the lottery. About the author: Laura Simmons grew up in northern Virginia and spent most of her career working for various department of defense contractors in the Washington, dc area. she has a fascination with all things met a physical she enjoys soap making, writing, jigsaw puzzles, bowling, vacationing at the beach with her husband, and studying tarot crads and other types of divination systems. little bits of karma is her debut novel.